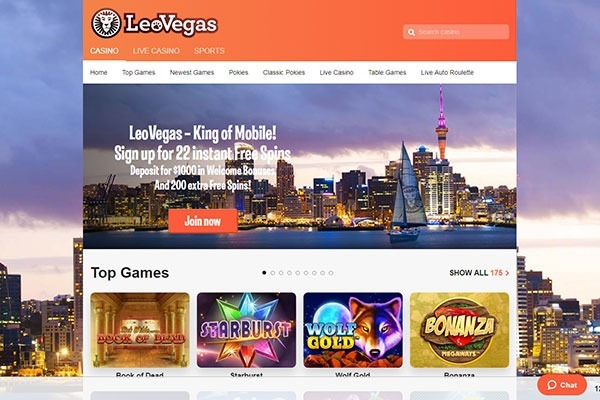 LeoVegas Casino is one of the new generation Scandinavian-driven online casinos, launched in 2012 and offering a crisp and modern feel to the standard online casino user interface. LeoVegas successfully mixes a modern minimalist look with a classic Las Vegas style and offers a competitive range of the best digital casino games from a cross-section of today’s leading online casino software providers. LeoVegas also take the modern approach to internet casino gaming to new levels with tier focus on providing a comprehensive and all-inclusive mobile casino and a full Flash-based desktop casino, providing the ultimate in fast convenient digital casino gaming. Kiwis love to play the hottest and newest pokies and LeoVegas not only supply just that, they offer a diverse range of the best pokies from top software providers including: Microgaming, NetEnt, NextGen Gaming, Evolution Gaming, Viaden Gaming, Cryptologic, Yggdrasil and Play’N Go. The casino offers a range that will suit all styles and preferences including a number of progressive jackpot games, 3 reel classic slots and 5 reel video slots. Not only is the range of close to 300 premium slots diverse, they are available in practice or demo modes as well as real money modes. This is a great way to ‘try before you buy’ and get to know what games suit your needs best. The casino offers a return to player (RTP) of over 96% as well as a good range of slots volatilities with higher volatility slots to suit those who don’t mind spending a bit more in hopes of a massive payday, and those who prefer a lower volatility, steady earner. LeoVegas also offer a range of 3 reel classic pokies and ‘fruities’ including: Gold Rush, Lucky 7, Super Nudge 6000, Ace of Spades, Irish Gold and Jackpot Jester 50,000. LeoVegas also include a variety of non-pokie games including no less than fourteen different versions of Roulette, half a dozen versions of Baccarat and thirteen different styles of Blackjack. the brand also offer a live dealer casino and a sportsbook with a few other games like Red Dog, Caribbean Stud Poker and Craps rounding out this Scandinavian brands’ offerings. The LeoVegas sign up bonus is especially designed for new payers who sign up for a free player account with the casinos. The bonus is designed to offer a solid boost a players bankrolls over the first few days at the casino by offering a sustained release over their first four deposits. The bonus also adds 22 no deposit free spins and more free spins to each of the deposit bonus amounts, ideal for Kiwi pokies fans. LeoVegas expects a minimum deposit of at least $25 and a play through or wagering requirement of at least 35x the bonus amount. LeoVegas also allow you to withdraw winnings if you are using your own money and not the deposit amount without forfeiting the deposit bonus, not all casinos will allow this. The free spins however are all subject to the 35x play through requirement. Bonus quality – our thoughts: The LeoVegas sign up bonus provides a useful amount in bonus money and is neatly divided over your first four deposits, creating a more sustained boost to your bankroll. The addition of free spins on each deposit bonus is also a nice touch and adds a greater level of diversity to the bonus package. The wagering requirements of 35x the bonus amount is also lower than some of our other recommended New Zealand online casinos. LeoVegas Casino claim that their main focus is on becoming the world leader in mobile casino gaming and, by all accounts, they’re well on their way to becoming just that. The brand are innovative and offer the exact same experience across all of their platforms from desktop/Flash through to their mobile platform. The LeoVegas mobile casino offers dedicated apps for two of the most popular mobile operating systems, iOS (Apple) and Android and fully optimized for almost every type of smartphone and tablet device. Other operating systems including Windows and Blackberry, can simply access the mobile casino directly in their HTML5 enabled mobile browsers. LeoVegas currently offer over 150 of their best pokies including a decent selection of progressive jackpot slots, 3 reel classic and 5 reel video slots as well as a host of table games including Roulette and Blackjack with live dealer versions for on the go play. Here is a top list of the most popular mobile games available on the LeoVegas mobile casino platform: Major Millions, Mega Fortune, Mega Moolah, Alies, Gladiator, Thunderstruck II, 6 x blackjack games, 6 x roulette games, Deuces Wild, Aces & Eights. LeoVegas Casino offers a range of promotions over and above the initial sign up bonus package, some are ongoing and other are once-off offers. News of all existing and up and coming promotions are regularly emailed to casino members so they know ahead of time and can take advantage of the offers that interest the most. The $100 000 summer celebrations: LeoVegas is giving away cash and other prizes including exotic holidays, free spins, iPhones and other prizes to the value of €100 000 in their summer celebration promotion. Victorious: LeoVegas are promoting the game Victorious with fully loaded cash and free spins opportunities, enter for a shot at being crowned the Victorious champion. Sports betting: Enter the LeoVegas Summer Games and get on the leaderboard for a chance at €10,000 in cold hard cash and free bets! The LeoVegas VIP program: Get invited to join the LeoVegas VIP club to earn more rewards, get bigger bonus offers and free spins, invitations to exclusive events and much more. LeoVegas offer a fairly diverse range of payment options and, while not as extensive as some of our other Kiwi online casinos, should still offer enough to suit all preferences. Kiwis can also enjoy the convenience of POLi and PaySafeCard, two of the favourites for Aussies and Kiwi pokies fans. The casino also offers easy payment processing with no additional charges to worry about unless you are planning on making numerous withdrawals. Withdrawal limits at this casino are 20000 EUR per month. POLi, PaySafeCard, Skrill, Maestreo, MasterCard, Neteller, Visa and Trustly. POLi, Visa, Neteller, Bank Wire Transfer and Visa Electron. LeoVegas Casino has their sights set on the very top of the online casino industry and so far they are most certainly headed there like a rocket! The brand offers an innovative and convenient product that can be enjoyed across all platforms, mobile and Flash, with same features and offers. LeoVegas is highly recommended for Kiwis looking for great pokies sourced from multiple software providers and easily accessible on the go.